“It looked like a twitch,” said Reighven’s dad, Spencer. Their pediatrician referred them to Daniel Birnbaum, MD, a pediatric neurologist at Children’s with 25 years of clinical experience. “Reighven had his first EEG at just 8 weeks old,” Cynthia said, “two weeks after his first seizure.” A seizure is a temporary “electrical storm” that occurs on the surface of the brain. Around one in ten people will have a single seizure in their lifetime. When a person has more than one seizure, he or she is considered to have epilepsy. For six months, the Zerlin family lived what Cynthia describes as “a rollercoaster of medications.” Reighven was prescribed up to 15 different medications. Infantile spasms tend to be more violent seizures that spread to wide areas of the brain. Reighven was in perfect hands. Twenty years ago, Dr. Birnbaum trained with Harry Chugani, MD, the pediatric neurologist who demonstrated that focal seizures could develop into infantile spasms. Dr. Birnbaum prescribed daily injections of ACTH, a hormone that the brain secretes to turn on adrenal glands to make steroids. It’s challenging, because it requires daily injections, so the parents have to do it. The task of injecting Reighven fell to his dad, who received training from a pediatric phlebotomist at Children’s. After the first injection, Reighven shrieked loud enough to shake the windows. Then Spencer relayed an astonishing fact: “That was the last time he ever cried.” Twelve weeks of daily shots, Reighven never cried again. 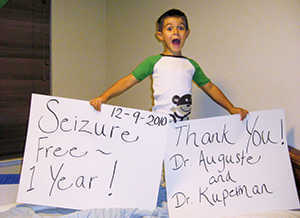 Reighven remained seizure-free for over 16 months. The honeymoon phase was over. To pinpoint the location of the seizure, Reighven underwent multiple tests, including an EEG, which records electrical activity, and MEG, which records magnetic waves, a neuropsychology test, and an MRI which revealed in Reighven’s temporal lobe a microscopic spot of “dysplasia,” which occurs when brain cells developing in an embryo fail to connect to their genetically assigned spot. Such faulty connections are the leading cause of epilepsy in young children. Dr. Kuperman decided Reighven was an ideal candidate for a temporal lobectomy, which is the removal of a portion of the temporal lobe. The data for surgeries in that area is very positive for having a good outcome. Cynthia and Spencer burst out laughing. Their ability to see humor in the worst of times came in handy as Reighven prepared for brain surgery. 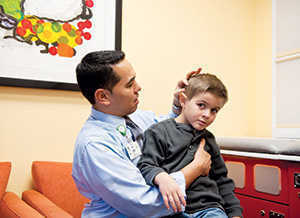 Dr. Kuperman began seven months of tests and evaluations, including a week-long video EEG. This required Reighven to return to Children’s for seven days with electrodes taped to his head. Cynthia translated “Reighvenese”: Pokes were shots or IVs. 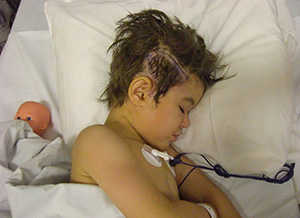 Stickers were electrodes glued to his head for his EEG. Thank you for helping me and Dr. Kuperman fi x your brain. I think, thanks to your help, we fi nally got rid of those pesky seizures. During your surgery we made some space in your brain, when we got rid of that bad brain that was seizure. Let’s fi ll that space with some of these cool words. Congratulations and happy birthday. Cynthia and Spencer finished telling their story standing in a kitchen filled with balloons the day after Reighven’s fifth birthday party, one year after surgery. Reighven’s psychological evaluation and IQ test showed marked improvement. Cynthia and Spencer are considering writing a book about their experience to aid other parents. What do they want to title it? Seizure Salad.